Concrete Section Checker Verifica s.l.u. 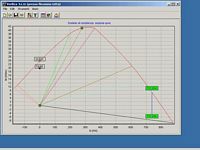 is designed to check reinforced concrete sections using the ultimate strength model ("stato limite ultimo") as described in italian normative. Verifica s.l.u. 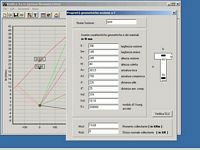 is designed to check reinforced concrete sections using the ultimate strength model ("stato limite ultimo") as described in italian normative. The reference document for the equations implemented in this tool is D.M.9/1/1996. The mathematical model used to define materials their stresses and deformations follows directives of EC2 (EuroCode 2). Application uses the "parabola-rectangle" stress-strain diagram to analyze compression stress in concrete and calculates the exact application points of forces by coefficients derived directly from integral calculus. Verifica s.l.u presents its results in the form of interaction diagram. It defines the "security zone" in wich (M,N) design sollecitation couple MUST to be in, in order not to lead structure over its resistent capacity. Check rectangular and T sections with a single click of mouse. Application runs under all Win32 platforms. Compilation of project requires any Delphi version including TeeChart component. However, checking procedures can be easily "isolated" and included in other programs without any requirements in terms of mathematical libraries.